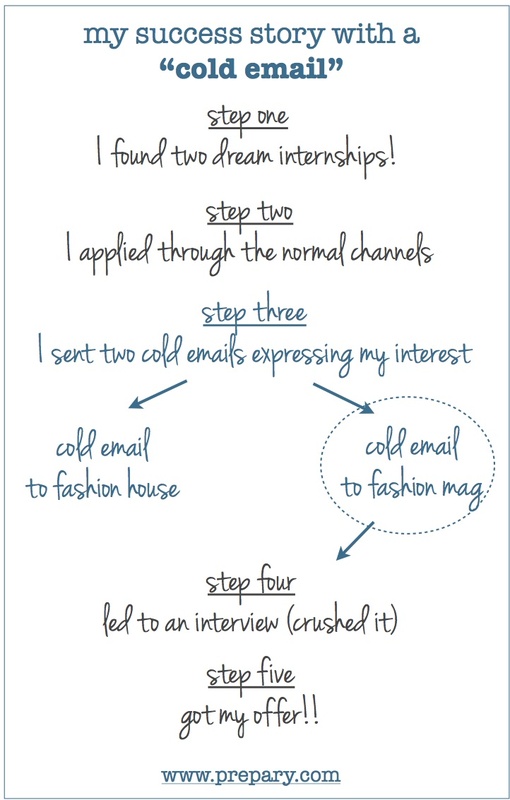 If you’ve worked with me or read this blog, you already know I’m a huge fan of the “cold email” (aka: reaching out blindly by email or LinkedIn message to someone at the company you want to work for). I’ve seen this help people land jobs and internships at their dream companies. Today, I want to share with you a true success story which one of our fabulous Prepary readers shared with us. Enjoy! “As the end of summer was drawing near, I began to search for a fall internship. After browsing through several internship posts from various New York fashion houses and magazines, I came to find two that I was truly interested in – one with a leading fashion house and the other with a leading fashion magazine. Unfortunately, the fashion house did not provide a contact and instructed those interested to email careers@company.com. However, I did some research on LinkedIn and found employees in the HR department (at the fashion house), From there, I found the company’s email format and reached out directly. Finding the true email address wasn’t a ton of work and didn’t take a ton of time. I attempted to email a few different email addresses for Molly Smith (sample name/same emails). The version that went through ended up being Molly_Smith@company.com (who would have thought there’d be an underscore!) My other attempts for Molly Smith bounced back. (i.e. MSmith@company.com, Molly.Smith@company.com, etc.) Sadly, I didn’t end up getting a response on this one, but I’m sure Molly did review my resume. How did I know that? Well, although I did not receive an answer from Molly Smith, I did receive an answer from the other cold email I sent that day (from the leading fashion magazine!) and I used the exact same tactic with that company. The response I received from fashion magazine was actually inviting me for an interview. The interview went well and shortly after I received an offer for a fall internship! I’ve learned the purpose of the cold email is to direct your resume to someone in a position who can act on what you’ve sent, rather than sending it to a general depository of resumes in the hopes that it might be read. Cold emailing proved to be a make or break move for me in obtaining my most recent internship. You cannot imagine how many times in a given week that I received a nod of approval or an “ohh” or “ahh” when I mention I am interning at leading fashion magazine. And while I enjoy the compliments of people that are impressed by an internship at such a prestigious company, I can happily tell you I got the position through cold emailing (and maybe that’s what they should be most impressed about). Based on my experience, I recommend trying this out as part of your internship search process. Once you’ve gotten the interview, you still have to do a great job and be the right fit. Getting the interview is half the battle. I had a 50% return on my effort and the pay off was sweet. And remember, once you’ve gotten a great response to a cold email like I did, you should still prep like crazy. After the door has been opened for you, go into that interview polished, prepared, and to do everything possible to close the sale.